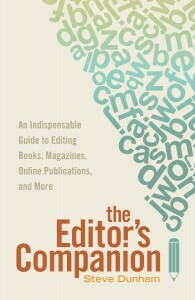 For those interested in editing resources, I have recently written a review of Steve Dunham’s The Editor’s Companion for the official blog of Editors Canada, the Editors’ Weekly. As always, comments either here or on the Editors’ Weekly site are welcome. For those of you who edit (whether your own work or someone else’s), do you have any good resources to share? It’s DBW’s first anniversary! If you have not had a chance to complete the reader poll, please stop by and have your say on changes for Year 2. Thanks in advance for your feedback! Even though I’m not hired for my editing skills, I still edit other people’s work in critique groups and one on one. Any skills learned are hopefully employed. I’d be curious to see what I might be able to utilize from reading through portions of the book that would be most applicable to my needs. As a quick side note, I’m truly enjoying Beginnings, Middles & Ends–another of your terrific reviews. Many thanks for all the helpful sources, Sue. Cheers! I think it’s fantastic that you’re helping other people with their writing. I would say that Dunham’s book has some useful nuggets for editing non-fiction, but for fiction there are some better resources available. It also depends on what type of critique your writers are looking for, since Dunham really gets into the weeds.